Take one idea, a pair of cameras, and a trio of friends and go shoot whatever takes your fancy in depth. That was the brief for “Dimensionale ™”, the 3D Film Festival presented by the SMPTE Australia Section, in association with the ACS, at the recent SMPTE09 Conference and Exhibition. The short film “S21″ took home top honours. 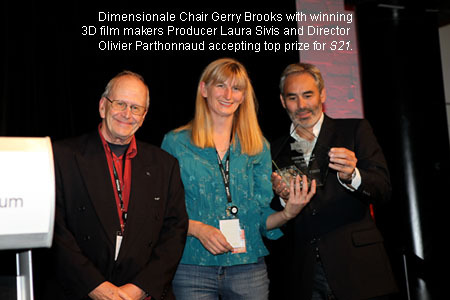 Producer Laura Sivis and Director Olivier Parthonnaud were both there to accept first prize, and thrilled with the result. The short – which tests and incorporates 3D lunar landscapes, lunar space stations and lunar vehicles, futuristic city skyscapes, and fight sequences – is the second phase in the research and development for the feature film “Station 21: 3D”. The short film shot in stereoscopic 3D, on a pair of Canon XLH1’s, includes 3D matt paintings, green screens, and animation seamlessly interwoven with live action. The challenges of shooting an action piece in stereoscopic 3D include minimum shot lengths. Whereas a typical modern action film will be cutting shots together that can be just a handful of frames long – stereoscopic requires shots to be a minium of about three seconds in duration, in order for the mind to register the 3D effect. So the action must be within the shot itself and one has to use the layers of screen depth by drawing the eye to new elements within the frame, to fulfil the function normally carried out by the editor’s cuts. Sydney based producer Laura Sivis, plans to take the concept further and shoot a 3D feature film entirely in Australia to make the most of the 40% rebate. The 3D filmmaker’s next project is a 3D feature version of the film, called “STATION 21 – 3D”. It’s an ambitious project, but an exciting one. The story kicks off with a lunar prisoner who escapes to earth via a holo-transport link. The lunar station commander finds himself trying to stop a killer hologram that can hold a weapon, but against whom weapons are completely useless. However he then discovers that keeping this dangerous seemingly mentally disturbed lunatic alive is the key to saving his very existence from the designs of a morally corrupt global corporate giant, which is hell bent on reaping the financial gains to be had in a world where the energy crisis and global warming have already become a way of life. Sivis who spent ten years designing and building military combat systems and flight simulators, before moving to the film industry, feels the project is also incredibly well suited to the games market – which is rapidly expanding into 3D. Parthonnaud has been in Sydney to present the feature project and meet with Post Production and Visual Effects companies, and begin casting.